Cattle enterprises in East Gippsland traditionally calve in Autumn. Central and East Gippsland covers an area of approximately 3.2 million hectares, of which about 30% is used for agricultural purposes. The remaining area is allocated to state or national parks, other crown land or forms part of the Gippsland lakes. The majority of arable land used for farming consists of dryland pasture and is used for grazing beef cattle and sheep as well as some dryland cropping. Small pockets of irrigated agriculture (horticulture, dairy) exist around Orbost, Genoa, Cann River, Maffra, Yarram and Bairnsdale, using of the river systems and sub surface water in the region. The topography of the region varies markedly. Farming is carried out in elevations from just above sea level to more than 800m in the Victorian Alps. Coastal and high country (alpine) plains, river flats, foothills and mountain valleys describe the landscapes used for primary production in central and east Gippsland. The soil types in the region are similarly variable and include sandy flats with low fertility, highly fertile river flats, clay loams and clays to very gravely soils in the hills. The East Gippsland regional package caters for the diversity of East Gippsland by including information from within and outside the region, and describing use of practices in the context of the different parts of the region. 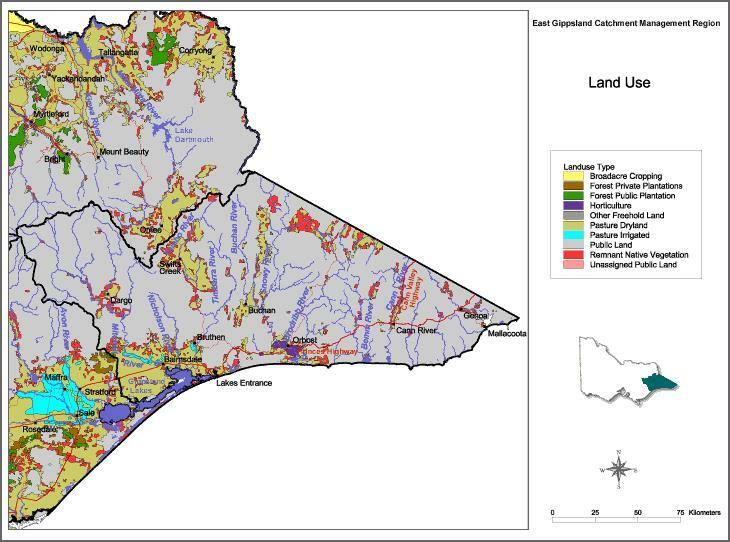 Landuse varies greatly throughout Central and East Gippsland (Figure 1). It is determined by the rainfall in the region, access to water, topography and soil fertility. The high country of East Gippsland is mostly used for beef and sheep production. Beef production has historically been Autumn calving cows with the aim of producing weaners for the weaner sales in March (Omeo, Ensay and Benambra). There has been some shift towards late winter and early spring calving within the region over recent years. The majority of herds are still predominantly Autumn calving. Sheep production for both wool and prime lambs was historically a major enterprise within the hill areas. However, there has been a steep decline in sheep numbers due to the presence of wild dogs, recovery from drought, and labour shortages. Australian Bureau of Statistics (ABS) data indicates a decline in sheep population of approximately 37,400 sheep (adults and lambs) since 2006. The land use in the foothills and the Red Gum Plains of Central and East Gippsland is predominantly sheep and beef with some cropping enterprises and irrigated agriculture along local waterways (horticulture/dairy). Sheep operations are most commonly Merino systems producing wool and prime lambs as well as store lambs. 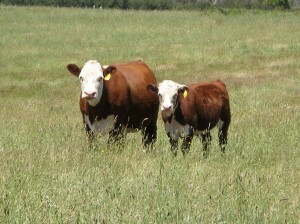 Beef enterprises in the region vary from producing store weaners to vealers and bullocks. Calving time is predominantly Autumn to late winter. The more fertile river flats around Orbost, Cann River, Maffra and the Lindenow flats are predominantly used for horticulture with some dairying on the Snowy River Flats. The majority of the Macalister Irrigation District around Maffra is used for dairy production.